It’s comments like these that make it all worthwhile! My Anglican colleague, Revd David Sheen and I are always busy at the University Chaplaincy; we feed curry or chilli to 60 – 80 students and staff once a week at our £1 Lunch, we sit and chat with a regular 20 or so students in our lunchtime drop-in café, and we worship or study the bible alongside several more (Bible study lunch has 8 regular attenders along with Taizé prayer & meditation). One of the most exciting ventures though, happened in a pastoral conversation with one of the students, who was bemoaning the fact that he didn’t have an opportunity of singing more recent praise music through anything that we did at the chaplaincy – so I said, ‘let’s do it!’. (I feel very much at home in that kind of worship, but I’d found that it’s hard to start anything new unless you know you’ve got a few people willing to give it a try!). And so, ‘Pizza, Prayer and Praise’ (PP&P) was born. We had three opportunities before the end of the last academic year to try out PP&P. The first was a great success with ten students coming to worship and pray and talk about how God is reflected in our lives (‘a city on a hill cannot be hidden’). Three weeks later, we had twelve students talking about how they came to faith, and in the first week of exams, we had 8 students reflecting on the ‘Thy Kingdom Come’ (TKC) prayer initiative (TKC is an ecumenical prayer initiative that runs for ten days from Ascension to Pentecost inviting people to prayer). The Kingdom has a King, and so we considered how we could make Jesus King in every part of our lives as we reflected individually on praying ‘Thy Kingdom Come’ in us; and we took up the challenge to pray for five friends, tying five knots in a length of brown string and then tying that around our wrist to remind us to pray. Students went away committed to God and committed to praying for each of their five friends every day throughout the TKC prayer initiative. PP&P has proved to be a great way of connecting with students and encouraging them in their faith, and we shall definitely be including it in our programme for the new academic year. Alongside our events though, goes the important task of day to day, one to one, pastoral care. This could be a snatched moment in the middle of a busy lunch, when someone shares that their grandparent is in hospital, or it could be a pre-arranged meeting when a student wants to talk through some issue that is worrying them with someone who will listen, give some tea and sympathy and, if appropriate, pray with them. I am also on the University’s Disclosure Response Team, so I am the first port of call for someone who wants to report an incident of violence or sexual assault against them. The team has been set up so that victims of violence and sexual assault can find out what support is on offer and have assistance from us if they want to report an incident to the police. As chaplains, we are there for everyone, those of faith and those who would tell me that they are not religious. And we are there to support staff as well as students. 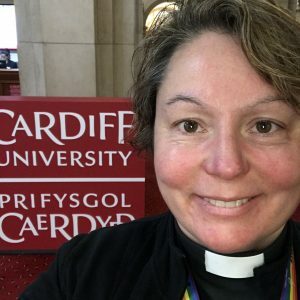 Please pray for us, and for students arriving in Cardiff in late September; university can be a lonely place when you’ve just arrived and don’t know anybody. And if you know anyone going to university, tell them to check out their chaplaincy; they might just be surprised at what‘s on offer! This entry was posted in News on July 15, 2018 by Lisa Medina.